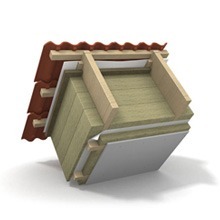 Used for roof insulation (rock wool) to prevent from outside moisture and precipitation. In dry weather allows excess moisture to evaporate from the wool. Roofing insulation to protect wool from internal excess moisture (vapor). Reinforced plastic film, on one side with aluminum foil. Use insulated pitched roof, walls, vapor barriers.